« Bill Young’s Dirty Digital Jobs Tour: Planning is Underway! As a US Army veteran with 28 years of service, Jerry Abney has never been one to back down from a challenge. Upon return from a tour in Iraq in 2004, the vision in his right eye deteriorated to the point of blindness. The very next year, he was diagnosed with retinoschisis of the left eye, leaving him with 5% of his original sight. Due to his vision loss, Jerry had to rethink his approach to most aspects of his life, including hobbies, work, and exercise. As part of the adjustment to his change, Jerry found himself at the VA’s Blind Rehabilitation Center in Birmingham, AL for computer training when he noted the sounds of a woodworking course next door. Intrigued, he introduced the idea of working with wood to his counselor, who agreed that the challenge associated with turning an idea into a tangible result was one tailor-made for Jerry. His natural curiosity for how things work coupled with his determination and discipline could let him explore new ways to make things, keeping him physically and intellectually stimulated– an attitude he has applied towards a number of different activities that most would say are impossible: he’s even figured out ways to water ski, scuba dive, and rock climb. Today, Jerry uses his ShopBot to reverse-engineer objects he finds interesting, making them work on his own terms. He runs a woodworking company, Amazing Vision Wood Work, out of his Miami home where he is always working on new projects and improving his technique. 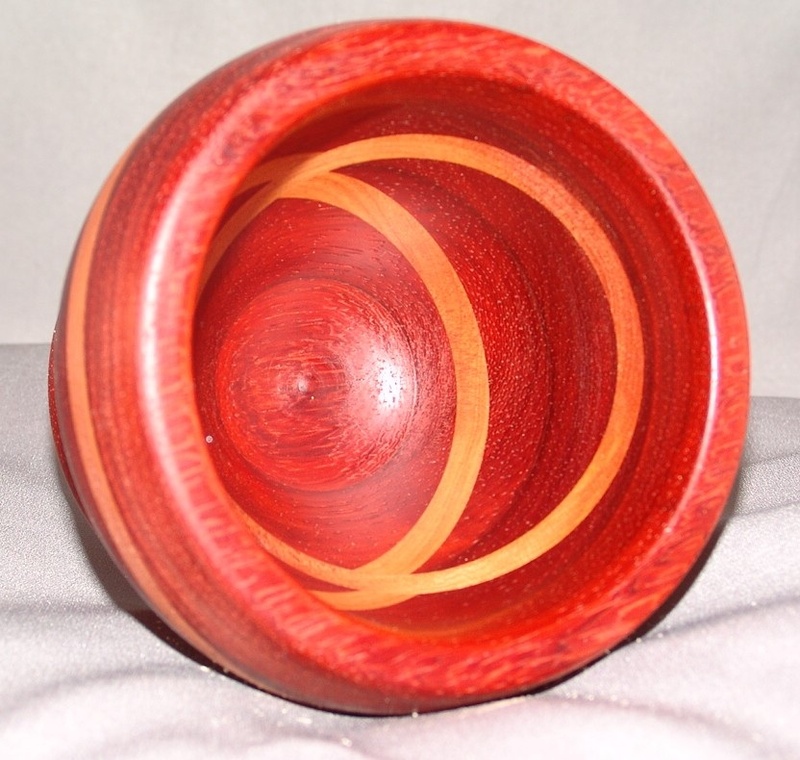 Jerry combines a number of different woodworking methods, including lathing and CNC to make products like this bowl. Jerry also makes signs and plaques for local businesses, servicepeople, and VA offices. 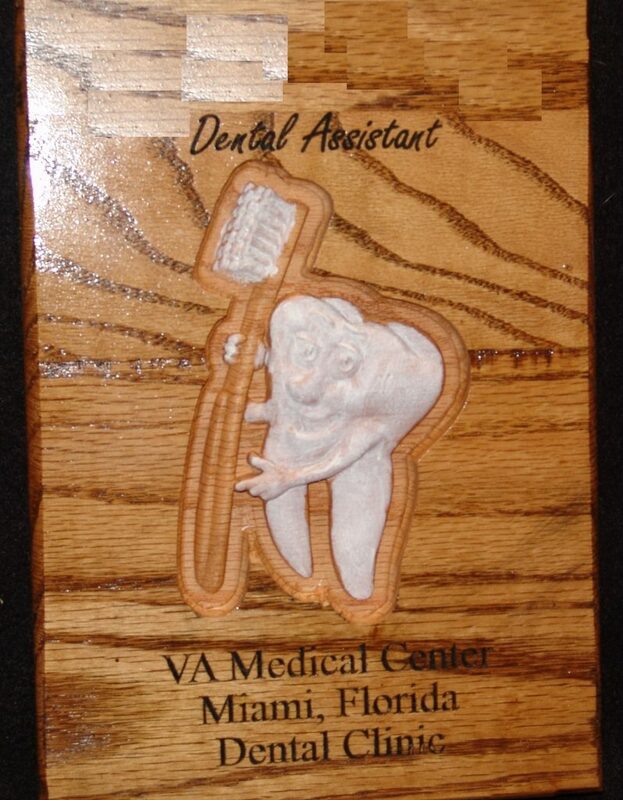 One of the advantages to Jerry’s experiences is that he’s blazing a trail in CNC and woodworking. Through Amazing Vision, he’s devised methods for working on a computer (he currently uses ZoomText for reading, typing and working in software) that work around the constraints of limited vision and allow him to cut on his ShopBot. He also operates a number of different machines and can impart his knowledge on to anyone with limited vision and an interest in woodworking. 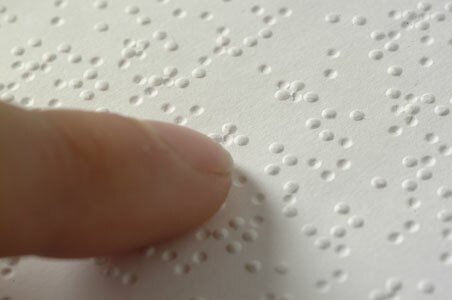 Braille is most commonly embossed into paper, since machining it can be difficult. 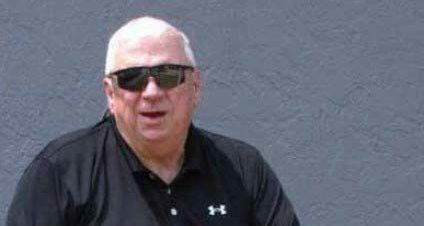 One of the most interesting developments to come out of Jerry’s experiences, however, is his work in machining Braille, the writing system used by the blind or visually impaired. Rooted in military history, it’s based on a code called “night writing” that was used by 19th century soldiers to communicate silently in the dark. Due to the relative letter size and space needed to form words, machining Braille requires a certain level of precision and patience. While there are resources for machining Braille, they require both expensive licensed software and tool additions that cost thousands of dollars, which are typically out of reach for the average hobbyist or small business owner. In his usual fashion, Jerry Abney refuses to adhere to that status quo. He is trying to find a way to make the process available for the average user, and has been working with ShopBot on some solutions. He has successfully cut Braille on several projects, but it can be incredibly time-consuming and mentally exhausting to even design a few words. 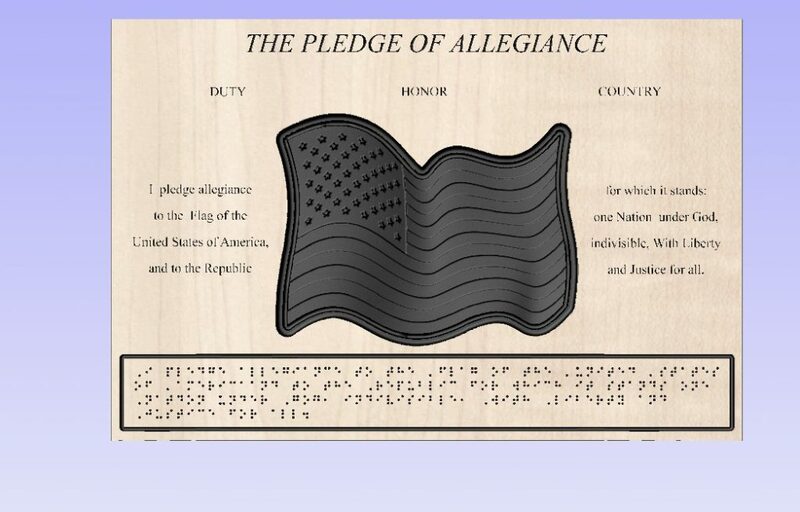 One plaque produced by Amazing Vision includes an American flag and the Pledge of Allegiance in both Latin and Braille alphabets. Because he had to design the cells manually, the Braille portion took him longer than the entire rest of the project multiple times over, but for Jerry, the thought of eventually making the process more accessible & cost effective is worth it. Though it is only composed of dots, the placement and order of the Braille Pledge of Allegiance took Jerry countless hours of concentration and patience. While people may enjoy the things he makes, the product itself isn’t what drives Jerry. It’s the idea of coming across something interesting and finding a way to do it on his terms. 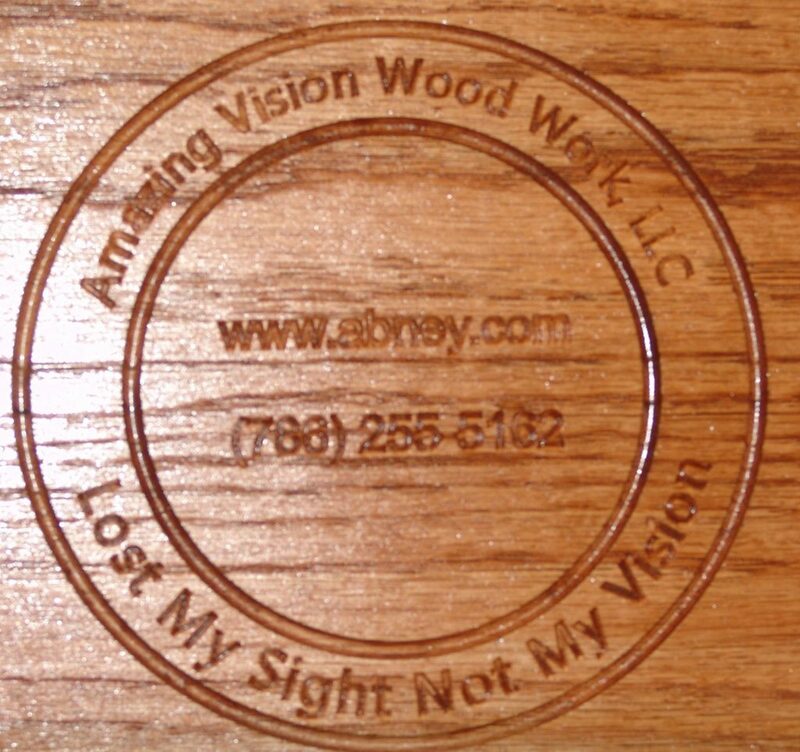 This is perhaps best displayed in his company’s motto, “Lost My Sight, Not My Vision”, which he carves into each of his final products as a stamp of authenticity. For Jerry, these pieces may each start out as raw material, but with patience and dedication they can turn into something wonderful.